Walt Disney Imagineers have created a new Alice In Wonderland-themed water play area at Disney’s Grand Floridian Resort & Spa. The new area is highlighted by an upturned Mad Hatter’s Hat that dumps water when it’s filled up and a teacup that spills water into smaller cups that shower guests playing below. 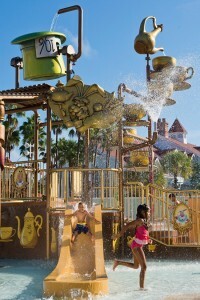 Kids can also enjoy sprinklers and water spouts on the ground, as well as two mini water slides. What do you think of the new themed water play area?